In Japan, New Years is called “shogatsu” or “oshogatsu.” It lasts from January 1st-3rd, and businesses close down so families can celebrate together. Schools often close for a week or two. The Japanese celebrate this holiday as separating the two consecutive years completely, which includes completing every prior obligation for a fresh start. The Japanese throw bonenkai parties so that they can forget all about the year before, and start the new one. Bonenkai parties are very festive and involve lots of eating and drinking. Japanese often do this with their work associates. Outside of the workplace, they decorate their homes with pine, bamboo and plum trees, making sure they are very clean. They eat soba, which are buckwheat noodles, because they symbolize longevity. Many people also tune into “kohaku uta gassen,” a TV program, which has a bunch of Japanese pop music performances. On the first of January, the Japanese often go out to view the sunrise. This symbolizes leaving the last year’s worries behind. For the rest of the day, people are supposed to enjoy their clean surroundings and do no stressful work. 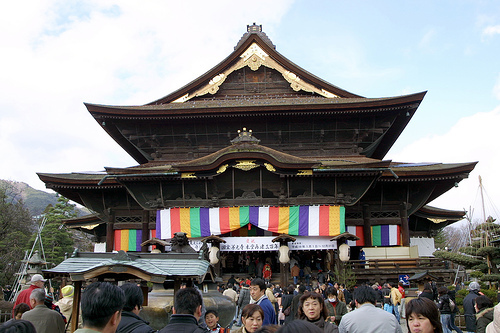 People traditionally visit shrines or temples, like Tokyo’s Meiji Shrine. Japanese people often write many different shogatsu cards, or nengajo, addressed to their friends and families, which have to be delivered on January 1st. Traditionally, the Japanese would conduct card games like karuta, play badminton and go kite flying, but this is declining in popularity. A traditional shogatsu drink is otoso, a sweet rice wine, and ozoni, a miso soup. 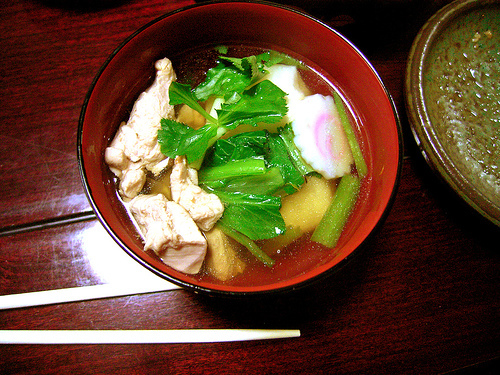 Ozoni is usually served with mochi, which are sticky rice cakes. There are a few different versions of ozoni, but it’s the traditional first food people eat on New Years, after toasting sake in the morning. 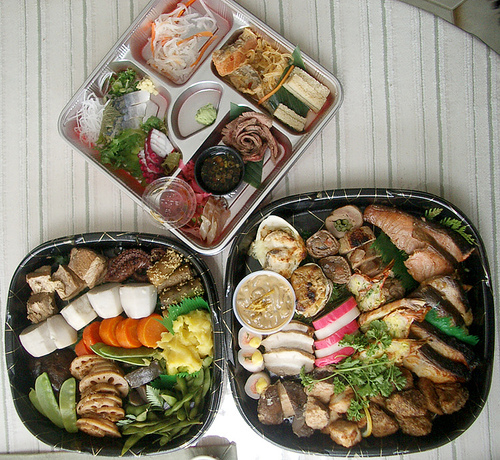 The Japanese also enjoy osechi-ryori (above), a dish that contains about 20-30 different items of food in a 3-tier set of boxes. Some common foods in these dishes are kuromame, boiled black soybeans; kazunoko, salted herring; and kuri kinton, mashed sweet potatoes served with chestnuts. Sushi and sashimi are common today as well, along with foreign foods. Sometimes it’s a little difficult to visit or be an expat in Japan during the holiday of shogatsu. It’s taken very seriously, and is definitely a product of Japan’s unique culture. Nevertheless, it is an interesting phenomenon to experience.